We always have a great time wandering our city and exploring the rich cultural history of the nation’s capital. On a beautiful day last summer, we met up with Joilynn Jackson for a fab 16th&B photo shoot. She’s such a talented photographer and we love her super chill, easy-going personality. Her pictures are the ones featured below. When we started to upload these pics, we decided to write about what encompasses getting ready for the ideal photo shoot. We always think about the big picture and consider how will this look not only on our blog, but across all social media platforms. Brainstorming. When starting the process we always meet and discuss what type of vibe we want for the shoot. Are we making a visual look book? Or maybe we are showing our everyday so readers can get to know us more. A color scheme is essential. Based on our vision and after collaborating with our photographer, we think about location, light, colors and elements around us. Then we plan our looks to flow with the overall big picture. Creating the looks. We plan each look down to how our makeup will change with our ensembles during shoots. We usually leave the house with two or three changes of clothes along with accessories, shoes, and coordinating makeup if needed. Since there are two of us, our outfits are definitely our own style, but still coordinated enough to not look disjointed. We even discuss how fabrics will look together. Logistics. Once we’re set with a time, place, and photographer, we plan how long it will take for each of us to get ready, transportation, childcare for kids, and back up plans for weather issues a few days ahead of time to make sure everything runs smoothly. Day of the shoot – have fun! It can be hard to loosen up especially if you are not used to being in front of a camera, but it always looks so much better than you think. You have to push past insecurities and just be natural. We found the pics of us being candid and ourselves are always our favorites. Plan! So your photos are in, you’ve sorted through the Dropbox files, and now you plan. We use the Preview app on our phones to create a visually cohesive and aesthetically pleasing social media feed. We sort the ones we want for the blog, the ones we want for Insta, Twitter, banners, etc., and the go from there. LET'S BE PEN PALS. LOVE NOTES ONLY, WE PROMISE. <3<3<3 – Love the new site ladies!! We're Bex and Mila! Two bloggers living in the DC-metro area. Together, we created 16th and Barton. A platform made with love for the everyday woman. Get on the list! 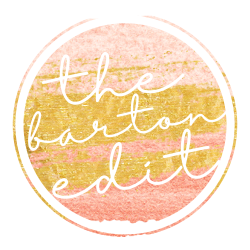 We'll send The Barton Edit (our weekly newsletter) and new blog posts straight to your inbox! We'd love to work with you. Check out our Partnerships page for details and a list of recent collaborations!